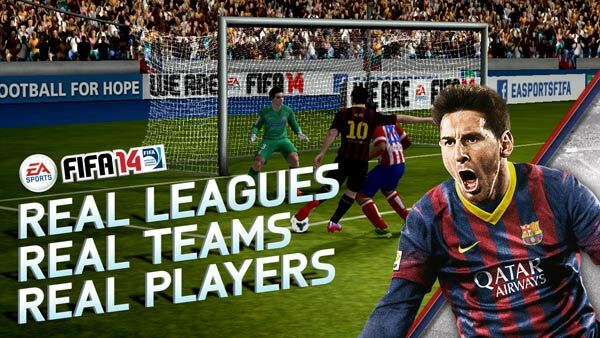 EA’s FIFA 14 has been released for smartphones and tablets of the Apple iOS and Google Android flavours. On these mobile platforms EA has chosen to release the game as a free-to-play (f2p) title, hoping to earn more via in-app purchases than it could selling the game outright. The game is a slightly over 1GB download for either platform. Meanwhile in console land it has been revealed that the PS Vita, 3DS, Wii and PS2 versions of the FIFA 14 game are simply re-skins of last year’s game. EA headline this football video game for mobile platforms as “REAL PLAYERS. REAL TEAMS. 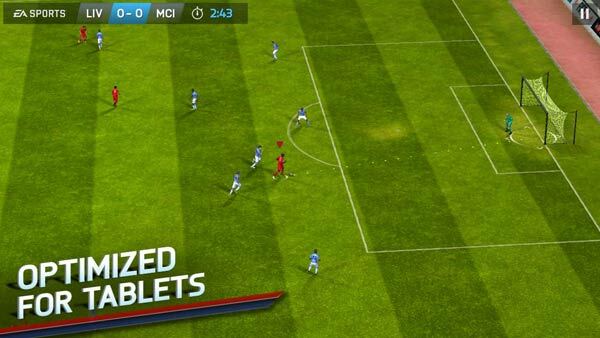 REAL LEAGUES” and describe it as “the most authentic football game on the App Store/Play Store”. There’s a lot of content in the download with 33 leagues, over 600 licensed teams, and more than 16,000 players. Also a long list of leagues are supported from the English Premier League and La Liga to the German Bundesliga and beyond. The game is played within “34 authentic stadiums” and commentary is available in English, French, German, Italian and Spanish. 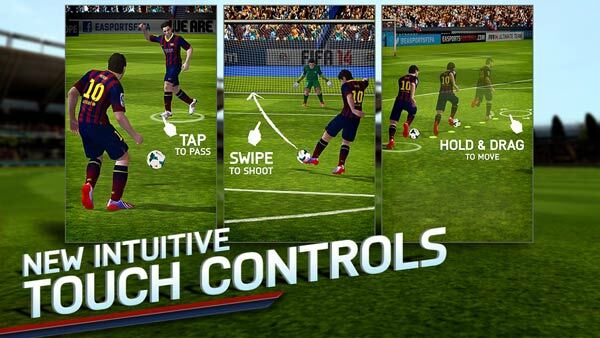 The new touch controls are heralded as conveying the excitement of every pass, shot, and tackle in the game. Features such as tap to pass and swipe to shoot are said to make the game fun, fluid and intuitive. Reviews on both the App Store and Play Store seem to back up EA’s claims as they are very positive on the whole; on either platform FIFA 14 has achieved 4.5/5 stars with thousands of reviews submitted already. EA has included quite a few features to players of the free versions such as ‘Match Day Madness’ with real world fixtures, injuries and suspensions reflected in the game. You can also build your fantasy team, choosing your play style, formation, kits, and more. In tournaments gamers can earn coins to buy new players and items. Also a “killer soundtrack with the hottest artists” is featured in the game. Wallets will need to be taken out to play three extra modes available; Manager, Tournament, and Kick Off. The app is a 1.17GB download on iOS and 1.35GB on Android. During its debut week downloaders of the Android game can get a FREE Gold Premium Pack. Yesterday EA confirmed to MCV magazine that FIFA 14 for PS Vita - £39.99, 3DS – £34.99, Wii – £32.99 and PS2 – £19.99, are all merely re-skinned versions of last year’s game on these platforms. “FIFA 14 Legacy Edition delivers unmatched authenticity that reflects the current football season with updated kits and rosters but no updates to gameplay or game modes,” said EA. However the report also said that iOS and Android versions are completely new and these mobile versions alongside the Xbox 360, PS3 and PC versions will contain the many and varied gameplay changes talked about by EA over recent months. Upcoming versions for PS4 and Xbox One are also going to be completely new, being the first on those platforms and featuring EA’s Ignite graphics engine. Incidentally buyers of the new consoles will be able to upgrade from their PS3 or Xbox 360 copy with a trade-in credit. FIFA 14 will be available to buy from Friday 27th September (or from today in North America). The “legacy edition” idea seems ok to me. It's not like much changes between yearly updates of the “full” version anyway, and at least this version is up front about it. They still make games for the PS2 ? Upfront yes, but £39.99 for a re-skin? They only stopped making the consoles fairly recently, there is still a big market for it. Isn't the full version just a reskin anyway. Very little has changed from what I've read. Fifa has stagnated imo. I think they should do away with yearly updates altogether, the changes are so incremental. Of course they won't because people buy them every year but only in sports games can you get away with releasing a new one every year that is basically the same with a few transfers changed and some cosmetic differences. Better model would surely be have a brand new game every time there is a sea change, like moving to a new engine and then do updates/dlc at the start of every new season when changes are merely incremental.